I’ve been known to “overindulge”. I do not have A+ dexterity. I tend to think of Stop signs as suggestions rather than commands. I often get lost in thought. I really, really want a motorcycle. While I lack the good sense or a caring enough of social base to keep me from making such a decision, thankfully the good people at Diesel (yes, the denim company!) are doing their part to prevent me from having my face and brains splattered all over some California highway. How so? They’ve teamed up with the acclaimed helmet makers at AGV to create one of the most drool worthy motorcycle helmets on the market. 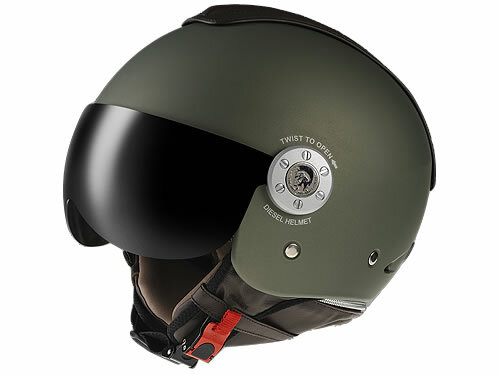 Available in four colors and sporting nifty, little details like a “mohican crest”, ergonomic neck support, and an interchangeable, scratch resistant visor this helmet is likely pushing me further down the path towards motorcycle ownership and thus accelerating my death clock rather than stalling. Oh, well. Where gold speaks every tongue is silent.